HILO, Hawaii, May 7, 2018 (ENS) – The Kilauea Volcano is erupting in the Lower Puna district of the Island of Hawaii, known as the Big Island, which is home to roughly 200,000 people and an attraction for tourists and adventure seekers. Hundreds of area residents have fled their homes under mandatory evacuation orders, since May 3, when the fiery lava began to flow into the Leilani Estates Subdivision. 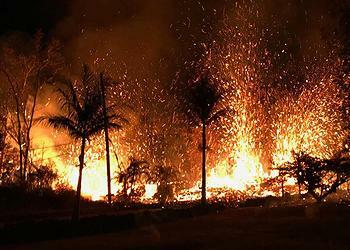 The Hawaiian Volcano observatory confirms that active venting of lava and hazardous fumes continue. Since the onset of this eruption, a total of 10 fissures have opened, and 35 structures, mostly homes, have been destroyed. Today there is a lull in volcanic activity and lava is not currently flowing from any of the 10 vents, although they are spewing toxic fumes, said Hawaii County Civil Defense officials. Although Highway 130 between Highway 132 and Kalapana remains closed due to a 1/8th-mile-long crack in the road, authorities are allowing residents of Leilani Estates into their homes temporarily to retrieve animals, medications, crucial documents and other essentials. Hawaii County Civil Defense said in a briefing today that by taking advantage of favorable weather conditions, they hope to get as many people in and out as possible. Hawaii County police and prosecutors said they will treat looting or vandalism as a felony. The warning comes as the Lower Puna communities of Leilani Estates and Lanipuna Gardens, with about 1,800 residents, are under an evacuation order. The American Red Cross reports 250 people sheltered in the Pahoa Community Center and 15 took refuge at the Keaau Community Center shelter overnight. Kilauea’s summit lava lake has dropped since the collapse of the Puʻu ʻŌʻō crater on April 30, and, as of Sunday evening was roughly 220 meters (722 ft) below the crater rim. Rockfalls from the steep crater walls into the retreating lake continue to produce ashy plumes above Halema’uma’u crater. Rockfalls and ashy plumes are expected to continue as the lake level drops. The U.S. Geological Survey reports about 500 earthquakes in the Kilauea Volcano area since Friday afternoon’s magnitude 6.9 quake, which was centered in Leilani Estates where the lava outbreak is occurring. Officials say aftershocks from the magnitude 6.9 earthquake continue and more should be expected, with larger aftershocks potentially producing rockfalls and associated ash clouds above Puʻu ʻŌʻō and Halemaʻumaʻu Crater. Hawaii County spokeswoman Janet Snyder said this afternoon that sulfur dioxide levels in the Leilani Estates are elevated from this morning. She said officials are not sure exactly how many of the estimated 1,800 residents in the Leilani Estates and Lanipuna Gardens subdivisions have actually evacuated. “You’ve got people who are sheltering with their relatives, friends, in their cars. So it’s very hard for us to know how many people actually did evacuate,” Snyder said. There also are people who have stayed in the two subdivisions “for whatever reason,” she said. The County of Hawaii and its service agency partners today opened a community information center in Pahoa to address the questions and concerns of people affected by the eruption in Puna. The center is open at the Sacred Hearts Church hall from 9:00 to 3:00 pm. Besides providing information about the eruption, the center will offer social service information for the evacuees from the Leilani Estates and Lanipuna Gardens subdivisions.